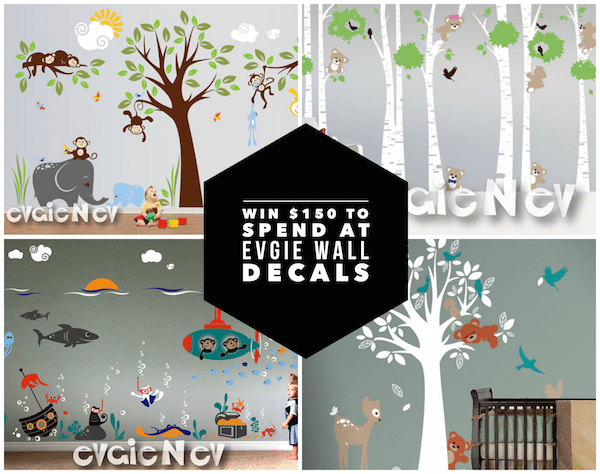 Time for our next monthly wall decals giveaway from Evgie. Do you have a real favorite yet you're playing for? Open worldwide, this ends 7/8. Let's kick off the summer right with a fun a giveaway for some wall decals! 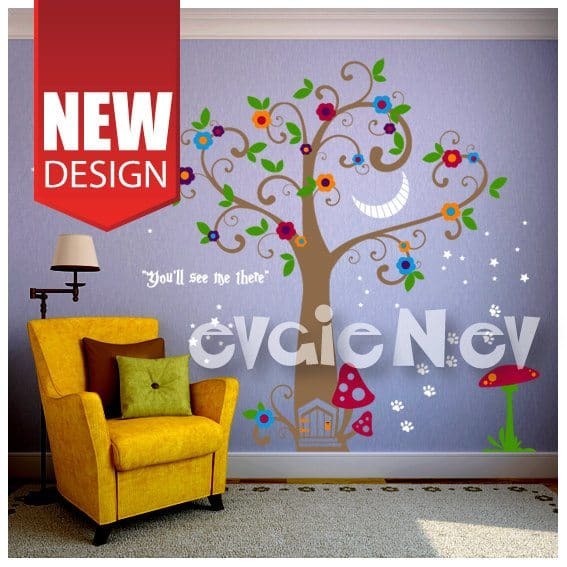 Evgie Wall Decals are an easy and fun way to spruce up any room in your house quickly and cost effect. 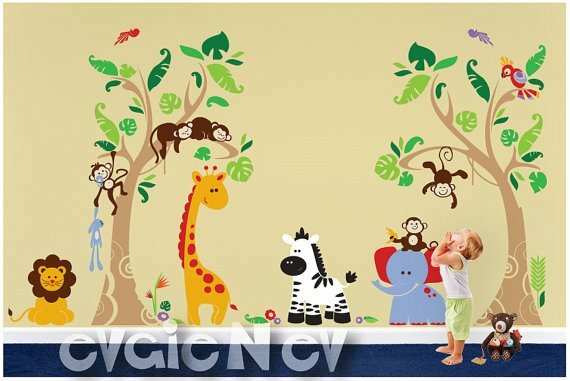 Evgie has wall decals that are easy to apply and can quickly change the appearance of any room. If you are expecting a new baby - you must check out the nursery decals.They have great options for kids and adults as well! They are so beautiful and fun! Visit their Etsy store and favorite a few of the designs! I love how easy they are to apply, and it looks like it was hand painted on! So cool! Girls Wall Decals, Fairy Wall Decals, Nursery Wall Decals, Cheshire Smile Alice in Wonderland- Alice in Wonderland Wall Decals with Cheshire Cat Smile is one of the popular theme from our Girls Wall Decals and Fairy Wall Decals collection, it is handmade using Top-Quality Matte Vinyl. Quick update and add your personal touch to any space, switch themes in child's room. FREE testing decal is included. Teddy Bears Wall Decals - Nursery Wall Decals and Baby Nursery Wall Sticker- Teddy Bears wall decals became a huge hit right from the start, and we are proud of countless positive feedback from around the earth and happy customers who purchased it, this is one of the easiest to install and always results in stylish nursery. Welcome to Teddy Bears lovers club. Custom Flag Name Outer Space Wall Decals- Our Custom Flag Name Outer Space Themed Wall Decals features NEW item. Metallic Silver Space Astronauts, Asteroids, Rocket ship and FREE custom Name. Lots of dots to create constellations. Elements come separately and can be arrange any way you'd like. Custom colors available. FREE testing decal is included. Evgie wall decals are shipped worldwide! They will send them to Europe and Australia...even countries like France Netherlands, German, England, and Italy! Now for the giveaway. One person is going to win $150 to spend on wall decals! Just enter on the form below. Giveaway is open worldwide. It will end at 1159pm EST on July 8, 2016. I love all of the nature & floral decals, especially the Trees with Birdcage and the Birch Forest. Love the bear climbing the tree to the bee hive. Would be perfect over a crib! I love the birch forest wallpapers but I would really like to have the nursery birch trees with owls for my new granddaughters room. They are all so cute!! I like Sleeping Lion Wall Decals - Jungle Wall Stickers - Safari Wall Decals, Fairy Wall Decals - Fairy Tree with Flowers and Stars Wall Sticker, Bears with Honey Pot Wall Decals - Honey Jar, Bee Hive, Bumble Bees, Large Trees and Bunnies for Children Playroom, and Wall Decal for Kids - Farm Wall Decals with pig, cow, chicken and sheep. I like the Jungle Safari and the Spaceship wall decals. My son would love the Spaceship Wall Decals in his room. We like the Outer Space decals. We live in the Rocket City so it would be perfect for our nursery. Love the family tree wall decal, it would look perfect in my living room. I like the cherry blossoms wall decal, love the pink colors. The Monkey Tree with Parrots is adorable. I like the panda bear decal. I like the Family Tree Wall Decal. The Panda bear decals are so cute, love!! I don't need a nursery anymore but the Nursery Large Birch Trees with 7 Cute Owls is adorable. I like the Trees with Deer the best. I really like the Jungle safari wall decals. My new grandson's room would be so cute. The Nursery Polka Dot Flowers are pretty groovy. ;) They'd look great in an adult room with bead curtains.